Being caught in the hornet’s nest of an unruly project is a unique kind of professional pain, particularly when you are supposed to be the leader. So let’s try to avoid that. Imagine if you could avoid the most common pitfalls and lead a winning team on a successful project. Doesn’t that sound like more fun? Of course it does. Because landing a successful project can be one of the most satisfying types of work. It gives you a great sense of accomplishment along with lots of real-life lessons. I’ve had the gut-wrenching experience where I have truly wondered if the project was going to fail catastrophically. In fact, I’ve had some episodes that were so close to disaster that I actually contemplated whether or not I would lose my job. That’s not fun, and fortunately disaster was averted in those cases. But I was definitely scared straight. It’s true that there is a certain exhilaration to that kind of edge-of-seat drama, but it’s not something I really want to repeat. The odds are not good with that strategy in the long run. So each time I’ve had to face different challenges, I have try to learn. I strive to figure out when, where, and how things went off track. I study the root causes and figure out how to make my approach better. Now, all of my failings can help you to do a better job too. 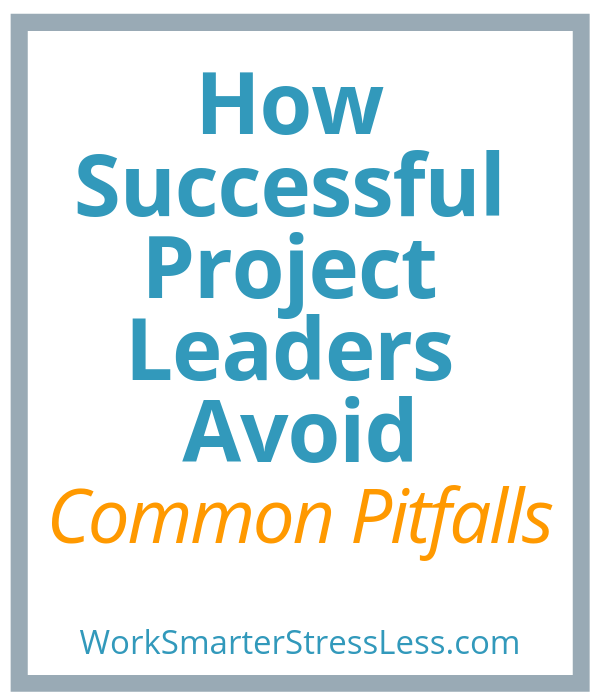 Because this post is going to share the best ways to avoid the most common pitfalls that project leaders face. Here are 5 big ones. Yeah, you think your goals are clear. But most likely they are not clear enough. Because different people bring different perspectives, opinions, and assumptions to the table. All of that needs to be taken into account. Instead of quickly agreeing on a simple goal description like “convert to the new system,” it is important to describe what that actually means. One person might assume that a very specific type of data cleanup is part of the conversion. Another person could be thinking that a related system is also being upgraded as part of this project. Someone else might be envisioning that a certain kind of training is going to take place. Savvy project leaders will work to get these sorts of things clarified up front. The goals need to be described in detail. It is important to define what success looks like in very specific terms. This detailed description needs to be put in writing and agreed to by everyone involved. The funny thing is that this is much easier to do than it might seem. Because before the project starts, people are more hopeful, helpful, and cooperative than they might be later on. Whenever I have skipped over this process, it’s mostly because I think the project goal is so simple and obvious that the exercise seems kind of silly and frivolous. And because it feels that way to me, I feel sort of embarrassed to do it. I don’t want to be seen as a project leader that creates a lot of extra busy work. But, every time I’ve skipped this it’s been a mistake. And every time I’ve done it, people actually appreciate the level of professionalism and attention to detail it brings to the project. It helps them to gain confidence in a project leader that is on top of things. Get the goals clear, in detail, written out, and agreed to by all the stakeholders. Once you are clear on the project goals at a detailed level, it’s time to work through how to achieve them. Everything can’t be done all at once, so a detailed plan is important. A project of any size or complexity will require careful coordination of a number of people and activities. But it’s more than that. There needs to be an intermediary between the starting line and the finish line. There needs to be milestones. Milestones, phases, chunks, whatever you want to call them, are needed to focus attention and energy in the short term. Any project requires some sequencing of events and usually those follow some sort of themes. Those themes help you to organize efforts in important ways. And they also help you to structure some momentum. Phases of a project are like mini-projects. Each time one of those phases is completed, it gives a sense of accomplishment. That sense of accomplishment is motivating, and much more so than the completion of individual tasks. They are a reason to celebrate and they are evidence that the project is succeeding. 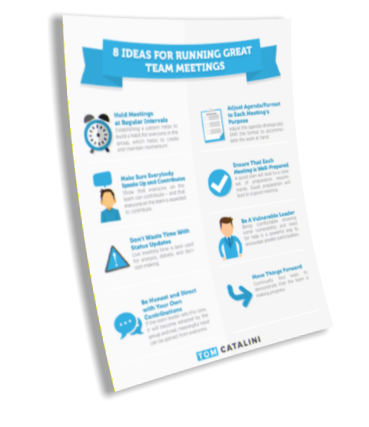 Your team (and you) need to feel that emotional boost along the way. Don’t let your project be a long, soul-crushing slog of tasks. Everything we’ve talked about already already points to people issues. They are the ones we are trying to clarify goals with and whose efforts we are trying to focus and motivate. You will see people in every aspect of this article. However, it is also essential that we call out people issues directly as its own pitfall area. Because it’s too easy to nerd out on the project-managementy stuff and overlook the simple fact that humans are the ones doing all the work. And humans are needy and messy and confusing. You really can’t get super clear and define everything in this category. This is more of a category that reminds you to pay careful attention to the mood in the room, the dynamics between individuals, the other things going on in people’s lives, and more. On the one hand, people are endlessly complex. On the other hand, most people are looking to make a meaningful contribution in their work. To feel valued and appreciated. And to have a voice in shaping the world around them. If you can be attentive to these matters, first by noticing them and then by adjusting to them, you will be well on your way to avoiding some of the most insidious problems a project can have. Sometimes you will need to pull someone aside for a talk. Other times you will need to change how you approach a situation. Often, you will have to cultivate a sense of trust and shared accountability. You may need to push yourself in this area more than any other, but you will undoubtedly experience the most growth and success if you do. Another idea that must permeate everything but also needs its own category is communication. This is probably the number one responsibility that a project leader has, because it will almost certainly be skipped by everyone else. People tend to under communicate. And once there is a formal leader assigned that responsibility is shrugged even further off. Because everyone knows that it is the leader’s responsibility to worry about stuff like that. A successful project leader embraces this reality. That is part of why people will support you in areas like defining the goals in detail or being open to addressing people issues. Because that is what we expect from leaders. Recognizing that, you can really lean in. Making sure that everyone is “in the loop” is one of the best ways to use your time. Nothing causes more problems on a project than miscommunication. While detailing goals and plans is certainly a part of this, so is cultivating communication in all areas. The project leader needs to be sure that people are talking. One on one conversations need to happen. Small group discussions are needed. The larger team needs to share information regularly. And the leader needs to communicate with everyone all the time. It might feel like you’re repeating yourself or that you are going too far, but that’s not true. Make sure that you are communicating, clarifying, and confirming often. 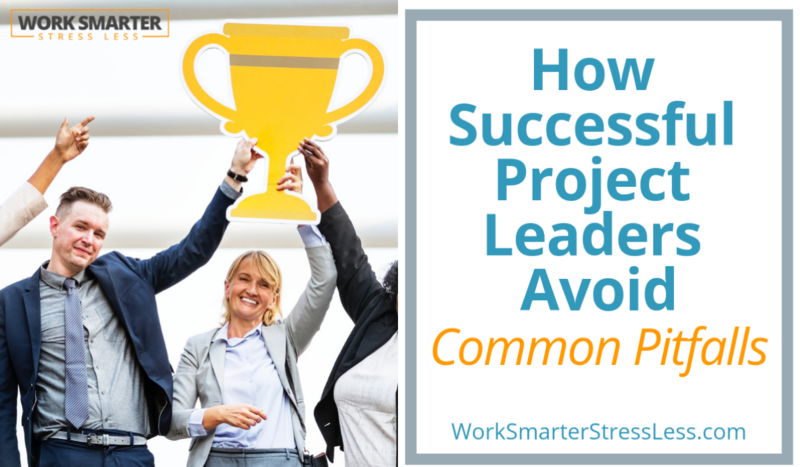 While this may seem obvious, it’s another place where many project leaders fall short. Mostly because it’s exhausting to keep up. With all of the details you are working, all of the communication you are fostering, all of the milestones you are tracking, and all of the people issues you are managing, it’s hard to find the time and motivation to stay organized. Many years ago I had a boss that insisted that I write him a weekly update every Friday. I had to summarize all of the highlights of my week and explain what I accomplished, what I was working on, and what I was planning next. It was annoying, but also mandatory. I simply had to do it. At the end of that year, when it was time for my performance review, I was amazed at how easy it was to pull together a compelling summary of my year. All I had to do was read through a consistent, structured summary of each of my 52 weeks. I was hooked. Because now I saw the value in keeping organized. On any project, the same is true. But the impact is much greater. Because your efforts to organize everything will help you AND everyone else on the project. The important thing is to be concise and consistent. The tool is much less important. In fact, the tool can be a hindrance. I’ve struggled to feed the Microsoft Project monster with little benefit emerging. And I’ve used a simple Word document with huge success. The format should be something that you could sketch out with a pencil on a yellow legal pad. Once you figure out how you want to organize things, put it in the simplest electronic format possible. Leading a successful project can be one of the most satisfying types of work. But running a project that has gone awry is one of the most frustrating and painful. That’s why it’s a good idea to prepare for the biggest pitfalls to any project and know how to avoid letting them get you off course. Clarify the project goals. Even though they seem pretty clear right now, they probably aren’t. 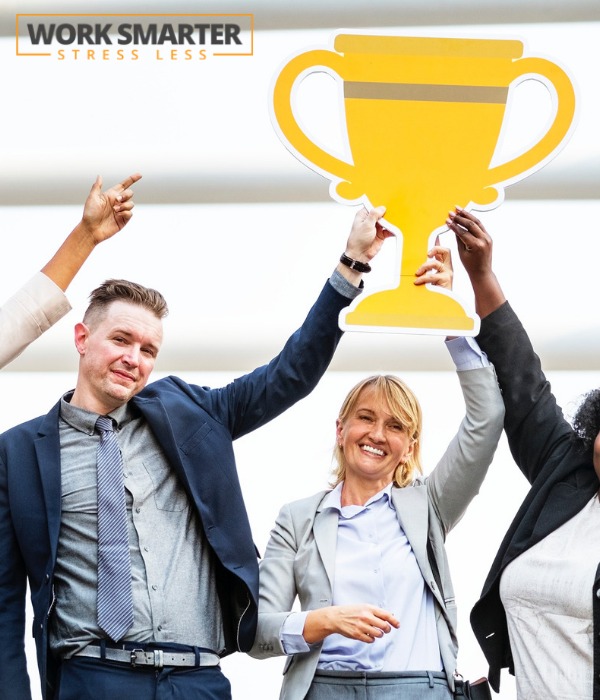 Get input and then confirmation from all of the key stakeholders to make sure you are all on the same page and you all know what success looks like. Create phases and milestones. A project of any size or complexity needs intermediary focus points to orchestrate efforts and build momentum. Manage people issues. Projects are performed by people. Each of them have individual perspectives, issues, and needs. All of which magnify in different groups and under different pressures. Cultivate healthy and productive experiences for those people and your chances of project success improve immensely. Over communicate. You may feel like you are repeating yourself or even annoying people. But you really can’t overdo this part. It’s always harder than you think to achieve a shared understanding and full buy in. Keep organized. You are the one person who knows everything about the project, so it is up to you to pull that together in a structured way and to share it efficiently and effectively with everyone else. If you work hard to avoid this top 5 list of pitfalls, your odds of project success will sky rocket. You will feel more in control, less stressed, and well-prepared for any eventuality (and surprises will happen). All of that will benefit the entire team, and the project itself.